Our polo school horses are world-class in that their abilities cater for a wide range of polo players. They give so much enjoyment to clients and allow them to make rapid gains with their polo skills and play. Lately we have had four wonderful guests who have been a pleasure to teach and have stayed in our home with our family. The evenings have been relaxed and enjoyable and my new style and teaching regime has worked marvellously for them. 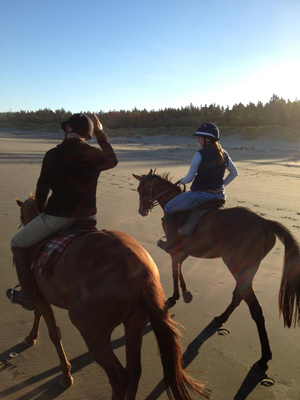 Of course we are dependent on the beach tides but in essence we have been getting up early on these beautiful mornings and working on our riding safely in the deep sand, through the pine forests. On the firm sand we have been schooling our horses and reinforcing our understanding of how to operate a horse so that when we take to the field it all comes together beautifully.